I have a bunch of favorite authors. Some of them, I've read ALLLL their books. Most of them-- well, I'm embarrassed to say that I haven't yet. There are just too many books and too many upcoming books.... and I really need like a month in a secluded area with just THESE books and nothing else to make me read them!! After I read The Female of the Species, I knew this was a "me" author-- I also need to start reading This Darkness Mine (but that one hasn't been out long enough to be on an embarrassment level). I love this author SO MUCH!! Be True to Me was one of my FAVE summer books, but I still haven't read these 2 books. I'm a bad fan!!!!!!!! Lauren Oliver is so high on my fave authors list, and yet this???? This is so shameful. After reading This Adventure Ends, I immediately wanted to get my hands on Foolish Hearts-- but for some reason I forgot all about her first book!! I've read most of Sarah Dessen's books, but recently I haven't been in the right mood for them. I really love her, so I want to get there at some point. Huntley Fitzpatrick writes books that just SPEAK to me. It's like I'm not even reading anymore and just fully living in the book-- or something. Why have I not read this book yet? I have read (and loved) EVERY Nina LaCour book until this one. It's been out all year and I just now got around to buying it. I'm a bad fan. Yeah-- this book has just been SITTING on my shelf mocking me for like 2 years. It's terrible-- especially since I am always hopeful that she'll eventually write a new YA. It's weird how I can read one book (The Truth About Alice) and know that I will love all the author's book, and this is a case of that. I know in my heart I will love these books-- I just need to read them. 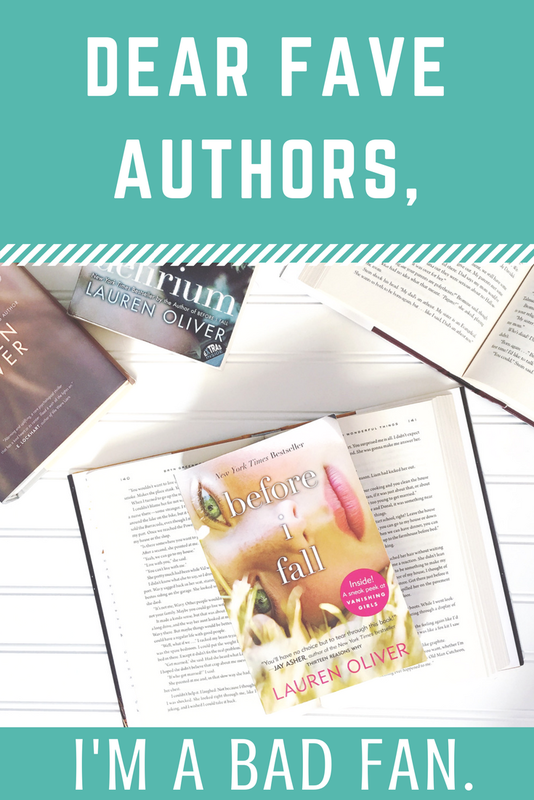 Do you have authors who you claim to LOVE, but haven't read some of their backlist?? Do you PINE for new books by your faves, but still have that older book by them sitting on your shelf? Which books do you think I should make top priority? I didn't even know Emma Mills had another book! But I loved This Adventure Ends, so I think I will check out First and Then. Right?? I didn't know about it either until I got Foolish Hearts and someone was like-- did you read the football book?? And I didn't know what they were talking about. But yeah, now I really want to read that. This is such a fun idea for a post! I definitely have this problem too. Sometimes books by my favorite authors are the ones I procrastinate reading the longest! I still haven't read Adam Silvera's newest release or the last book in Sarah J Maas's ACOTAR series and they're two of my favorites. I started The Summer of Chasing Mermaids in the spring, read 1/3 of it and got distracted by something else. It's still on my currently reading shelf, but at this point when I finally pick it up I'll need to start all over again lol. Yes!! I am a Margaret Atwood fan and a Diana Gabaldon fan yet am behind in reading all of their books. Ughhh too many books to read!!! What a cool post idea! I am definitely guilty of this-- I'm trying my best to work through my favorite authors' backlist titles this year, but there are some I have yet to get to (*cough cough* The Weight of Feathers by Anna-Marie McLemore, which makes NO sense because she is seriously in my top five favorite authors). I read A Madness So Discreet last month and really enjoyed it! First & Then is a favorite contemporary, and if you like Nina Lacour, you'll definitely like We Are Okay. Thanks! I'm so glad to hear that about WE ARE OKAY because I ADORE Nina LaCour. ADORE. I really want to read another Mindy McGinnis book-- because after reading The Female of the Species, I KNOW I'm into her stuff. Honestly, if you like Griffin, you have to read The Unfinished Life of Addison Stone. It blew me and my co-blogger away. Delirium was pretty good. I was a little disappointed in the ending of the series, but it was a great ride. My favorite book of her's is Before I Fall (Vanishing Girls is close behind). A.S. King is my fave magical realism writer. I thought Still Life was fantastic! 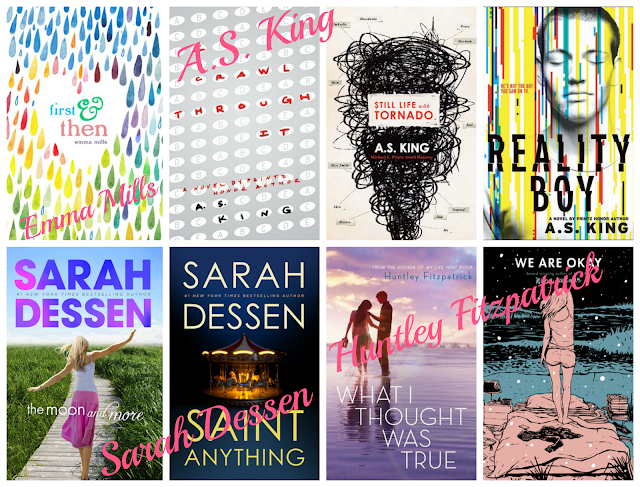 I am Dessen trash. I have read them all. 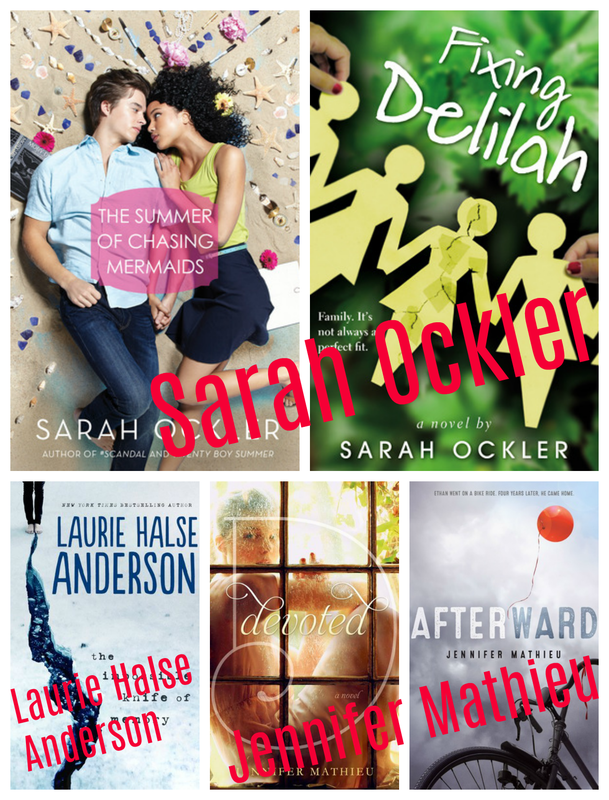 Ockler and Mathieu are two other faves. I am working through Ockler's backlist, and I took Moxie back from my co-blogger, so I hope to read it soon. Good luck getting to all those books. There are so many of my faves up there. I LOVED the Addison Stone book too!! I was 2nd in line to get it signed at BEA because I was SO excited for it! 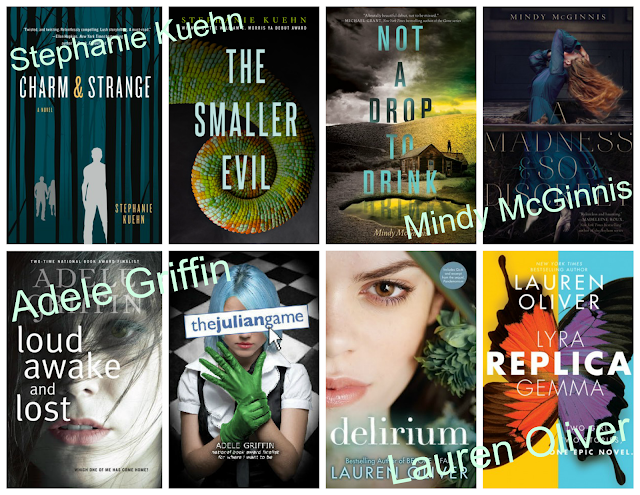 I really want to read Delirium because of how much I've loved Before I Fall, Vanishing Girls, Rooms, and her MG series. And OMG I am so behind on A.S. King and I love her stuff SOOO much. The Impossible Knife of Memory is - I think - the only YA I haven't read by Anderson. I want too. I think I was nervous when it first came out because it dealt with the military, etc. an those books make me nervous because my brother is in the army.